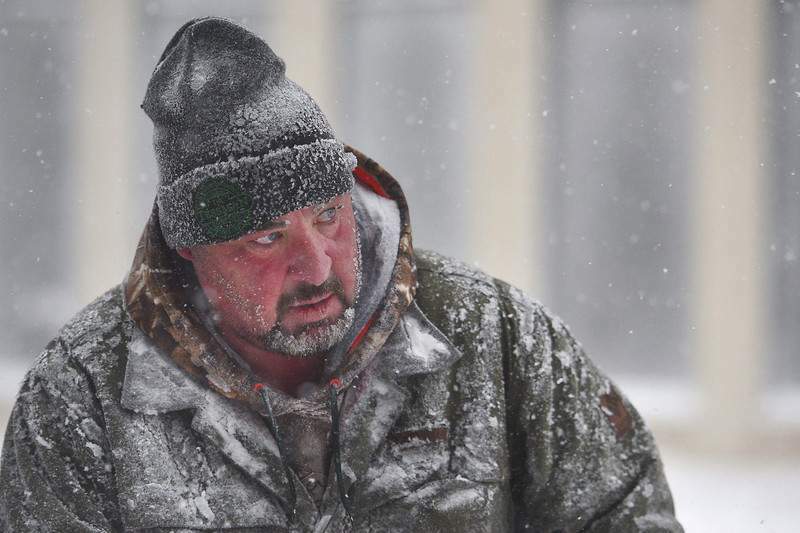 Associated Press photos James Schoenhard, with Schoenhard Lawn Care, plows sidewalks downtown Saturday in Sioux Falls, S.D. A storm system stretching across the U.S. has dumped a foot of snow in the upper Midwest. 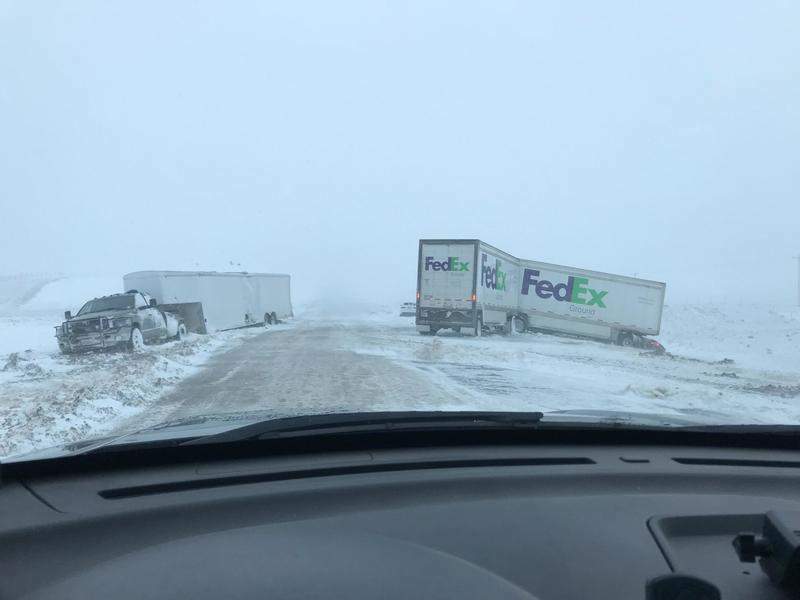 Nebraska State Patrol show stranded motorists including several trucks on Interstate 80 near Sidney, Neb., on Friday. MINNEAPOLIS – Minnesota residents slogged through a mid-April storm Sunday that dumped 2 feet of snow on parts of the Upper Midwest, coated roads with ice and battered areas farther south with powerful winds and tornadoes before plowing toward the Northeast and Mid-Atlantic U.S. The Line 5 pipelines were temporarily shuttered Sunday afternoon due to a power outage at Enbridge's terminal in Superior, Wisconsin, Enbridge spokesman Ryan Duffy told the Detroit News. Enbridge decided to shut down the twin pipelines until weather conditions improve in the Straits of Mackinac, which links Lake Huron and Lake Michigan, Duffy said. At Minneapolis-St. Paul International Airport, where more than 13 inches of snow had fallen, 230 flights were canceled Sunday. Two runways were open, but winds were still strong and planes were being de-iced, spokesman Patrick Hogan said. On Saturday, the storm caused the cancellation of nearly 470 flights at the airport. Two northeastern Wisconsin communities, Tigerton and Big Falls, received more than 2 feet of snow over the weekend, the National Weather Service in Green Bay reported. Parts of the state that were already blanketed were getting a second helping of snow on Sunday. The heavy snow caused part of a hotel roof to collapse over a pool at a hotel in Ashwaubenon, which is next to Green Bay, but no one was in the pool area at the time, and no one was hurt. The storm finally let up in South Dakota, allowing the airport in the state's largest city, Sioux Falls, to reopen for the first time since Thursday. Interstates 90 and 29 in parts of eastern South Dakota also reopened, and no-travel advisories were lifted across the state border in southwestern Minnesota. In Michigan, freezing rain that began falling overnight had left roads treacherous and cut power to hundreds of thousands of homes and businesses by midday Sunday even as heavy snow was forecast to dump a foot or more of snow on parts of the state's Upper Peninsula by early Monday. The airport in Charlotte, North Carolina, tweeted Sunday that severe weather had caused a ground stop and forced air traffic controllers to leave their tower. The National Weather Service said it received a report of an afternoon tornado sighting near Greensboro that caused damage to at least seven homes and destroyed a mobile classroom at an elementary school. To the south, Lexington County, South Carolina, officials said several buildings were damaged and toppled trees were blocking roads. No injuries were reported in the Carolinas, but tens of thousands of homes and businesses were without power Sunday.